By Jason Kim: Klitschko manager Bernd Boente ruled out a rematch for David Haye against IBF/WBA/WBO heavyweight champion Wladimir Klitschko, saying it’s not going to happen. Boente said that if Haye wants to fight one of the Klitschko brothers he can fight WBC heavyweight champion Vitali Klitschko, who is very eager to fight Haye and knock him out. When Haye was asked yesterday if he’d like to fight Vitali, Haye made an excuse that Vitali doesn’t fight often enough for him to fight him. The way Haye said it seemed to suggest that Haye has zero interest in facing the huge 6’7″ Vitali and risk getting battered by him. A lot of boxing fans see Vitali as the stronger Klitschko brother, and we saw how the 6’6″ 242 pound Wladimir was simply too big for the 6’2″ 212 pound Haye last weekend in effortless 12 round decision win in Hamburg, Germany. Haye is saying over and over again that he wants a rematch with Wladimir, but there seems to be no reason for Wladimir to give him one because of the one-sided nature of their fight. Haye needs to take Boente up on his offer for a fight against Vitali, and then hope to do well enough to get another shot against Wladimir. 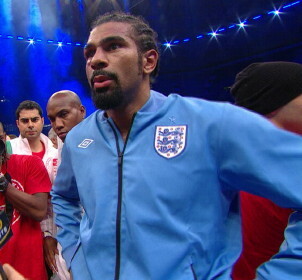 There’s a small possibility that Haye can maybe pull off an upset against Vitali. We’re talking a really small chance, but maybe if Haye fights hard enough to look good against Vitali boxing fans might for the idea of Haye facing Wladimir. Haye needs to take the Vitali fight, because it’s the best paying fight out there for him and it’s the only road to a rematch against Wladimir right now.